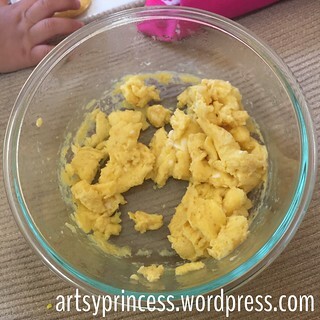 Microwaved scrambled eggs | Living life in the carpool lane.. I microwaved scrambled eggs for the first time. Seriously, where has that been all my life? I’m always a bit hesistant to cook eggs in the morning because it’s such a hassle. But microwaving? What a life saver! I’ll be the first to admit that microwaved scrambled eggs are NOT as good as stove top scrambled eggs. However, it’s a quick and easy way to get some eggs for breakfast. I scrambled two eggs into a microwave safe bowl. I added some Lawry’s season salt for taste. Then, I popped them into the microwave for 30 seconds. At that point, only the outer edge of the eggs are cooked, so I stirred it all up and added another 30 seconds. Stirred that up again and did another 30 seconds. By then, most of the eggs are cooked, only a small amount of liquid is left. I mixed that around and found that they remaining liquid cooked itself as the eggs were sitting there and mixed. And there they are in all their microwaved glory. Now the consistency is much firmer than eggs I normally cook on the stove top. I supposed microwaving them for less time, or adding some milk could soften the consistency. However, I didn’t mind the firmness at all. In fact, I believe that the firm consistency is the reason K liked them so much. She usually spits out my stove top scrambled eggs. I think it may have something to do with the slightly mushy texture it leaves in her mouth. But these eggs were a hit! I can’t wait to experiment with some add-in ingredients to make these eggs more exciting and yummier! 1 Response to "Microwaved scrambled eggs"
This has truly been a life saver for me in the morning. My son loves eggs.